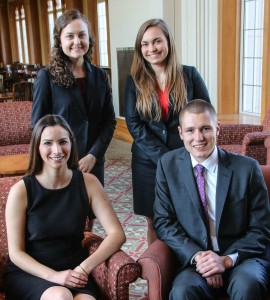 Lauren Andrini, Margo Borders, Catherine Gawron, and Robert Sikorski, all 1Ls, have each received a $10,000 fellowship award from the Notre Dame Law School’s Program on Church, State & Society to work for a religious institution in a legal capacity this summer. Andrini’s fellowship will be at the General Counsel’s Office at the United States Conference of Catholic Bishops in Washington D.C. She will be working with several different attorneys and will be focused on researching and writing in various practice areas, including immigration, litigation, communication, and religious liberty. “I’m very excited for this opportunity because I’ll be exposed to diverse areas of law. I’m interested in religious liberty, as well immigration and litigation, so I’m thrilled to have an internship where I can explore all these areas of law and also incorporate my Catholic faith,” Andrini said. Borders will work for the Archdiocese of Chicago Office of Legal Services, which provides legal counsel to the Catholic bishop of Chicago and to the parishes, schools, and agencies of the archdiocese. She will be assisting the attorneys with legal research, drafting documents, and providing legal advice to the many agencies supported by the archdiocese. “I applied for this fellowship because it seemed like an amazing opportunity to be able to experience religious-institutions practice early in my law school career. I also studied theology as an undergraduate and have a strong passion for my faith, so I was looking for an opportunity to merge my passions of faith and the law,” Borders said. Gawron will be working at the Office of the General Counsel for Presence Health. Presence is a Catholic, nonprofit health care corporation that oversees 12 health care entities in the Chicago region. She will be assisting with transactional health care work, including contracts, compliance and regulation, tax work, operational conflicts, labor and employment, and work related to Presence’s recent merger. “I applied for this fellowship because it provided me with the opportunity to merge my career interests with my faith. I have a strong desire to work in transactional health care law, and actively pursued health care law externships,” Gawron said. Sikorski will work at Catholic Charities of Chicago’s Legal Assistance Department, which provides legal services to low-income individuals, such as assisting pro se litigants and representing people with family, housing, and consumer law issues. He will be gathering facts and conducting legal needs assessments for pro se litigants, performing legal research and writing, and updating legal resource files. As part of NDLS’s commitment to educate a “different kind of lawyer,” the Program on Church, State & Society’s fellowships provide students with the financial means to take advantage of summer intern opportunities and explore the many legal career options that combine religion in our society, said Richard Garnett, the Paul J. Schierl/Fort Howard Corporation Professor of Law and director of the Program on Church, State & Society. “I am excited to hear about these students’ experiences when they return to NDLS in the fall,” he said. Originally published by Denise Wager at law.nd.edu on April 24, 2017.